Aight, enough of venting in my last post. 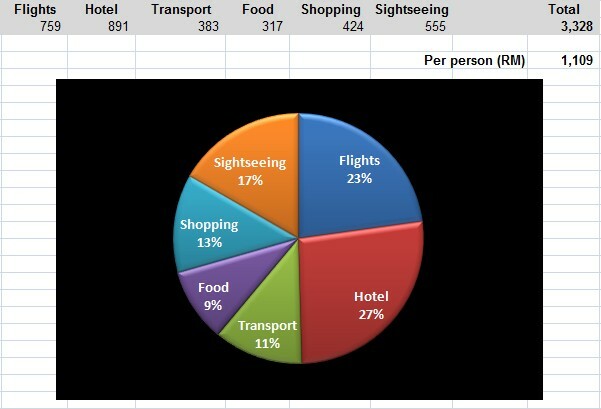 =P Took a break from blogging last week to focus on planning the itinerary for my next cuti-cuti-China trip. It's kinda stressful to plan for 2 vacations back-to-back but that's the best I could do to accommodate my work schedule. 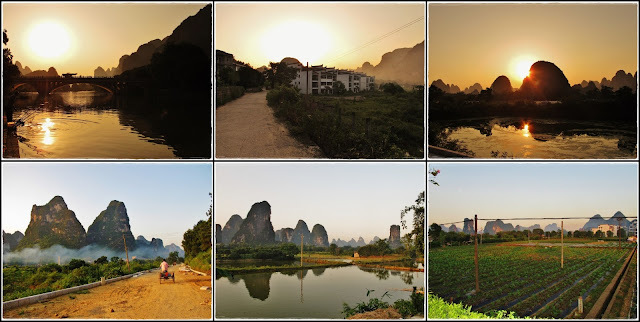 =) Anyway, here comes the massive update on the last 5 days of my trip, mainly in beautiful Yangshuo. After resting for one day, we were all recharged and ready to get back on track with our original plan. 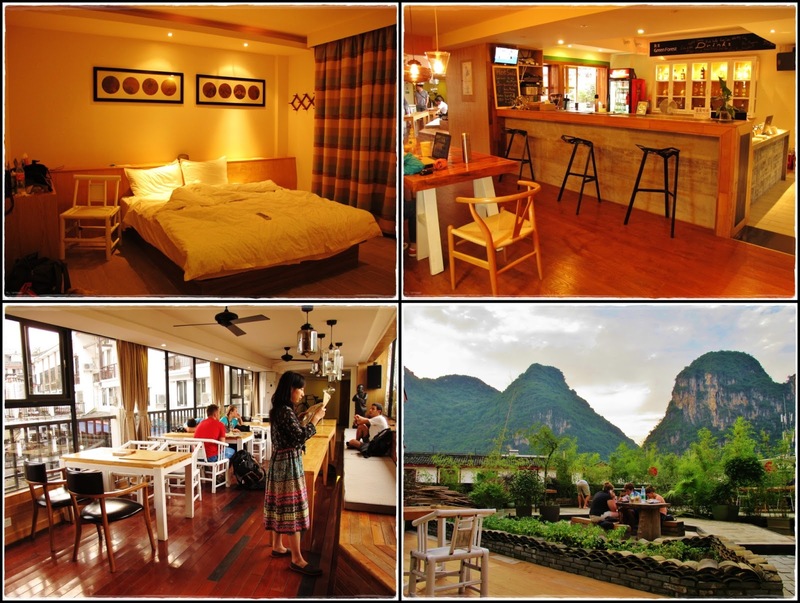 Our hotel in Guilin was right next to the bus terminal so it was super convenient. 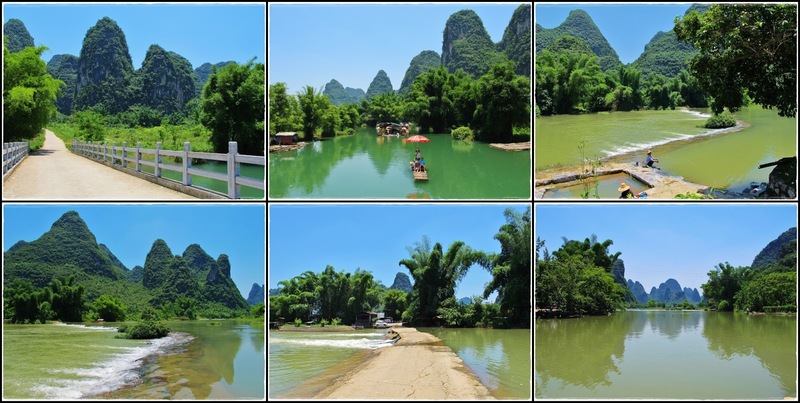 The buses from Guilin to Yangshuo are very frequent and departs every half hour. We bought tickets for the 12.50pm express bus (直达空调快车) and it costs only CNY 22/pax. I guess I've lowered my expectation so much that I was actually surprised that the bus departed on time sharp at 12.50pm...lol!! 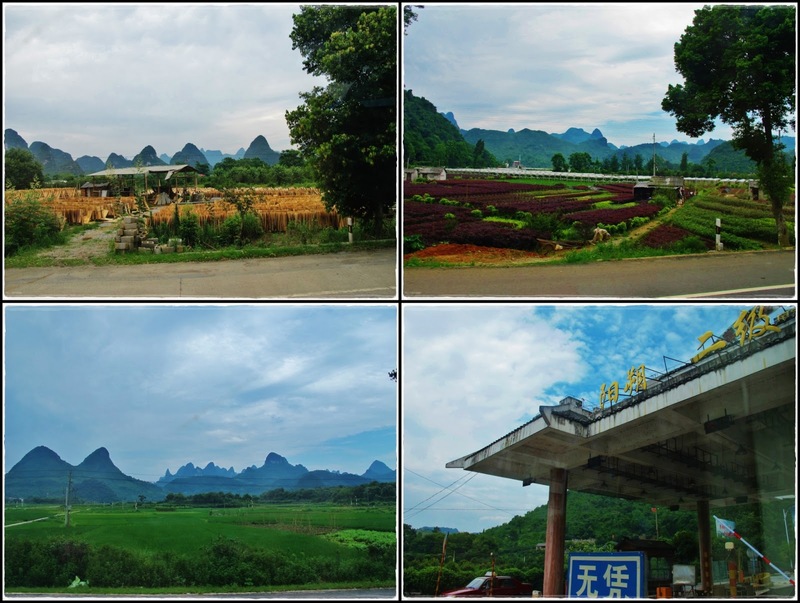 Anyway, all is good and we're on our way to the scenic county of Yangshuo! 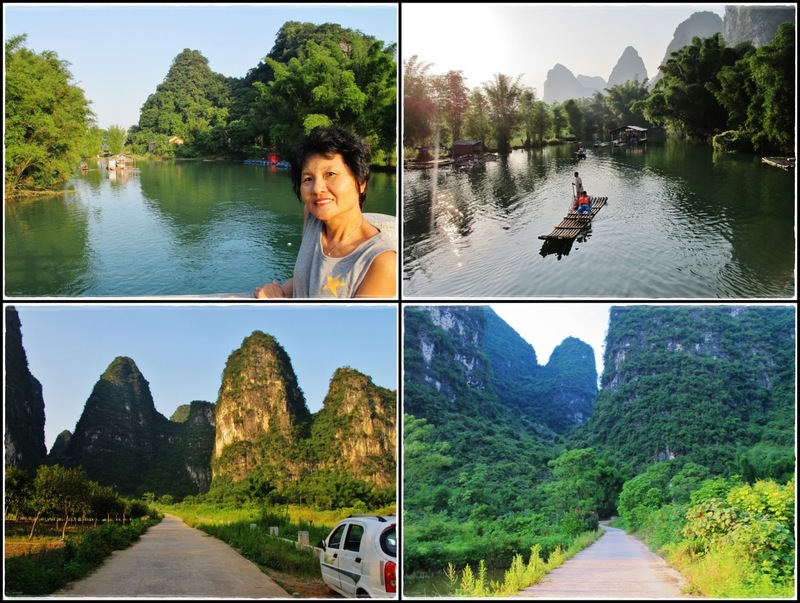 The journey took about 1.5 hours with nice scenery of the karst mountains along the way. Unfortunately, there were trees on both sides of the road throughout the whole journey so it was hard to capture any nice pics of the scenery. 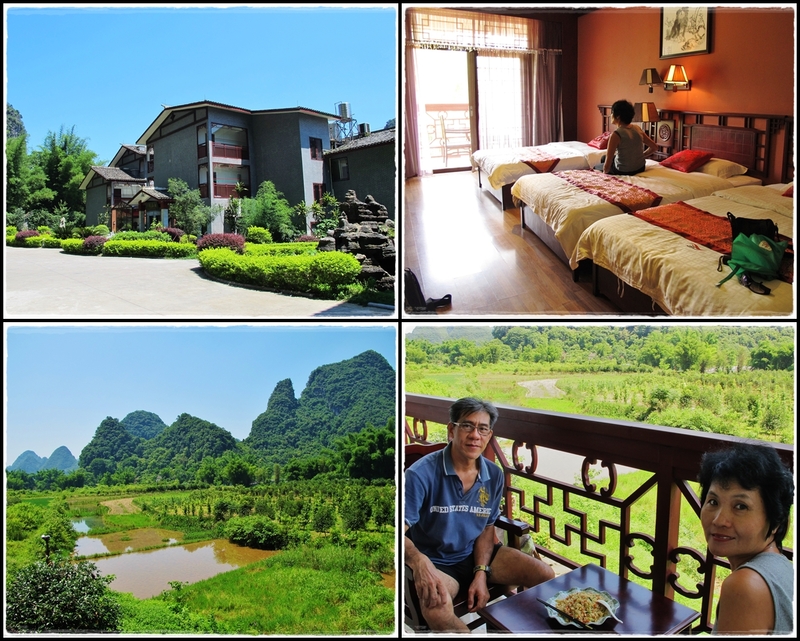 We finally arrived Yangshuo at 2.30pm. The bus terminal has such a scenic backdrop! =) The hostel that we booked was only 400m from the bus terminal so we decided to walk. Strolled along the famous West Street and Li River. 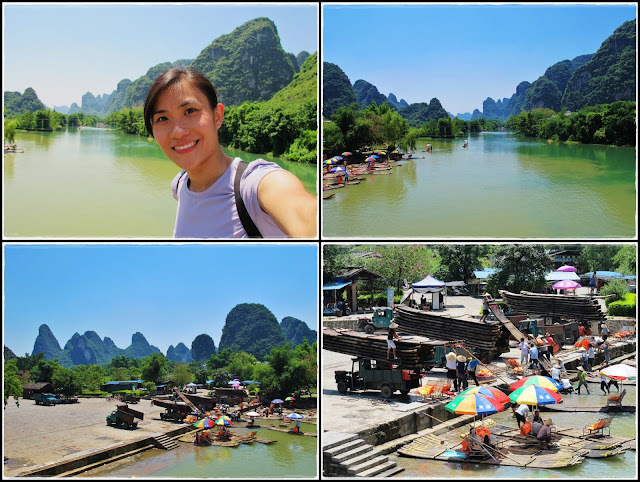 Despite the crowd during the Dragon Boat Festival holiday, it was still nice to walk around the city with the laid-back atmosphere and karst scenery all around. Beautiful day and nice weather to walk around the city. Had a funny encounter when we were ordering our dinner. Mom was asking me what I wanted to eat and I just answered "cincai cincai cincai cincai" (means whatever in Hokkien), and the lady taking the order looked at me and asked if I wanted the "Qincai Dumpling 芹菜猪肉饺子" since I repeated cincai so many times...lol!! We all burst out laughing and I quickly said "no no no"! Before we even finished laughing, mom made another joke when she ordered "家婆豆腐"...mother-in-law tofu?!?! Woke up early and left the hostel at 6.30am to the bus terminal. It was already so bright but the streets were still deserted, a total contrast to what we saw the day before. 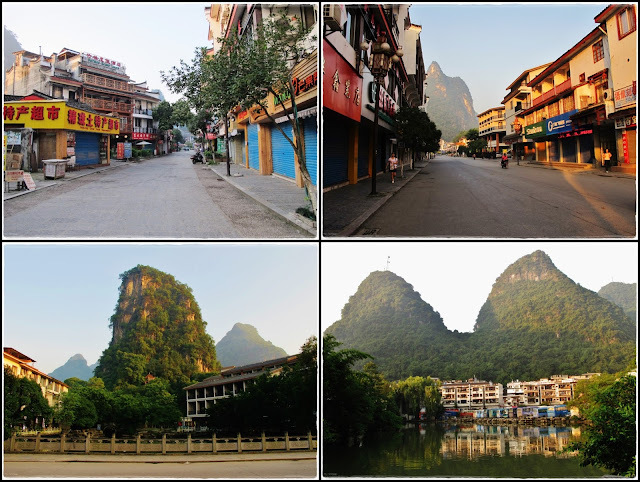 This is the tranquil side of Yangshuo that has disappeared since it became a popular tourist destination more than a decade ago. 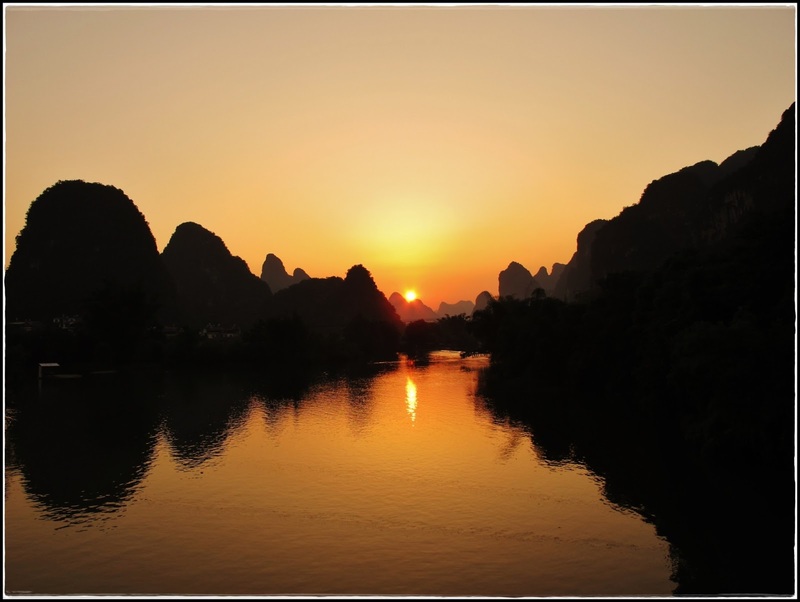 The first bus from Yangshuo to Yangdi pier (杨堤码头) departs at 6.40am. There were some local old people and some tourists taking the same bus. 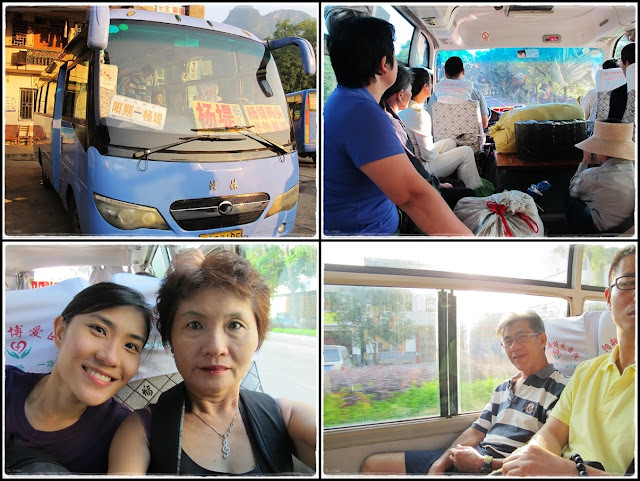 The journey took an hour and cost CNY 9.5/pax. 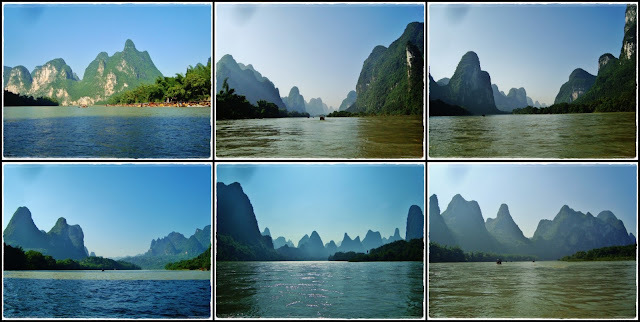 The reason why we wanted to go to Yangdi pier was to take the bamboo raft along Li River to Xingping (兴坪码头). 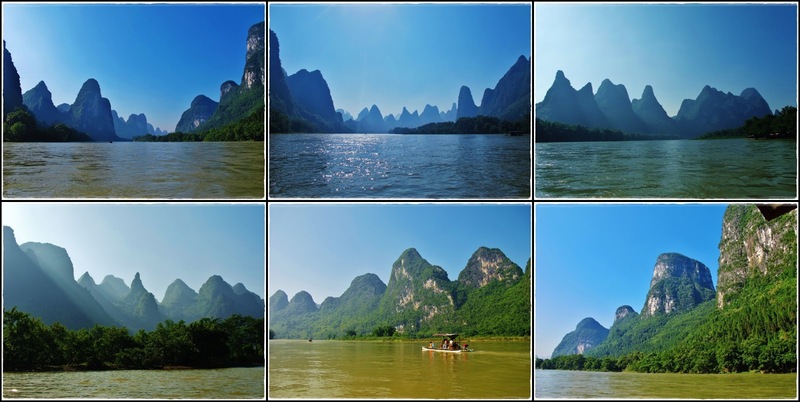 The most beautiful scenery of Li River is on this stretch and the scenery on the CNY20 notes is actually taken at Xingping. I've actually contacted a boat man in advance and arranged for him to bring us on his bamboo PVC raft. He was supposed to wait for us at the pier when we arrived but unfortunately he stood us up at the very last minute telling us that we've been 'targeted' by other touts at the pier (even though nobody approached us at all). He just said he couldn't take us anymore or else he would probably end up in a fight with the touts. Wth...seriously?!?! 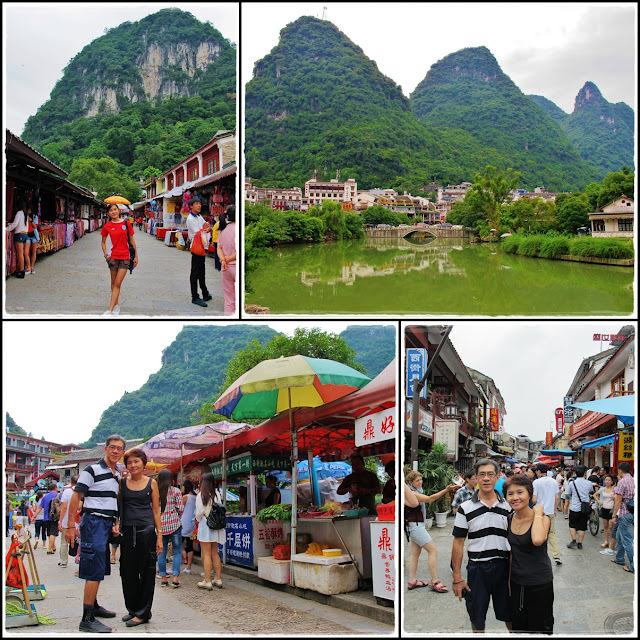 After getting off at Xingping pier, I wanted to hike up Laozhai Mountain 老寨山 (yes the peak where I point) so I asked mom and dad to walk around the pier while they waited for me. 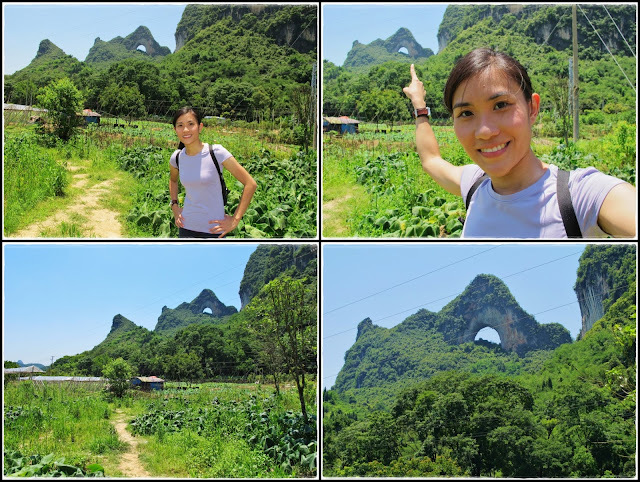 I found out about this mountain while I was doing my 'research' for the itinerary. 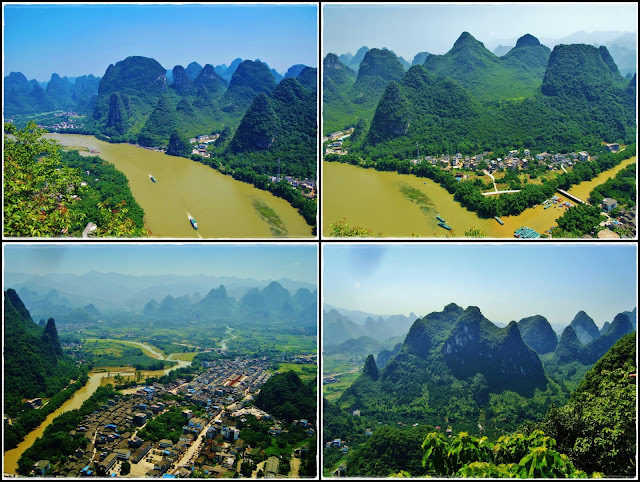 The peak of this mountain gives a spectacular view of the Li River and the surrounding scenery. Best of all, it's free and not a lot of people come here. =) There was a cute map drawn on the wall at the beginning of the hike and some arrows guiding hikers along the way. The earlier part of the hike is pretty easy but it gets more challenging as I get higher coz the steps are uneven and steep. There's also a ladder on the way to the top. It took me about 20 minutes to hike to the Bird's View Pavilion at the top of the mountain. Ain't too bad a hike for young people but be prepared to sweat...haha!! The reward for my effort - AMAZING view of Li River, Xingping town, and the surrounding karst scenery!!! Selcas to prove that I was there...lol!! After taking photos at the pavilion, I saw this telephone tower and I've read that "the views further south on the river are possible by scrambling over the rocks behind the pavilion near the telephone tower, but this can be quite slick and risky and is not recommended unless you are quite at home on rocks and at heights". I would love to have a photo like this but I didn't wanna risk falling off the cliff so I conveniently passed my camera to a local young boy who was there to help me take some pictures from the rocks. Took a no air-con bus from Xingping back to Yangshuo for CNY 7/pax. The windows were opened and I felt like I was eating dirt throughout the 1-hour journey...lol!! After chillaxing in the hostel for an entire afternoon, we went out for some night view of West Street before moving to another hotel in the outskirts the next day. After spending 2 nights in West Street, we moved to another hotel farther from the crowded West Street and nearer to Yulong River - Dragon River Retreat Hotel. Even though it was slightly more expensive than the hostel, we had the opportunity to enjoy the tranquility of being out in the countryside surrounded by beautiful scenery of the limestone peaks and river view. The hotel also provided free shuttle to pick us up from West Street to the hotel. 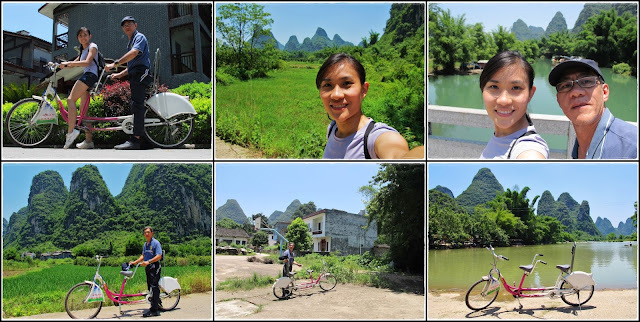 Instead of using the main road, we cycled through the small villages along the river to get to Moon Hill. The receptionist at the hotel told us the directions briefly but because we didn't have a map for these villages, we ended up getting lost for a few times. It wasn't that bad getting lost coz the scenery was pretty along the riverside. We got to a river bank and and asked for directions from a local old lady who was washing clothes by the river. 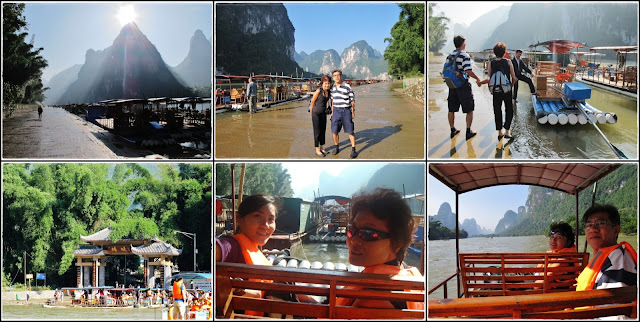 She pointed us to a 'bridge' (bottom middle pic) and asked us to go to the other side of the river. The water level in the river was quite high so part of that 'bridge' was flooded, got our shoes wet crossing this 'bridge' but it was pretty cool. This vacation was really quite a relaxing one coz we had a lot of chillax time. After dad and I got back from cycling, all 3 of us slept for the entire afternoon. I woke up in time for my second shift of cycling at 6pm. This time was with mom coz it wasn't hot anymore. Instead of using a tandem bike, both of us got a mountain bike each this time around. Took the easier route this time to avoid getting lost coz I wanted to catch the sunset. Cycled through some farming villages and decided to make a u-turn before getting lost again. 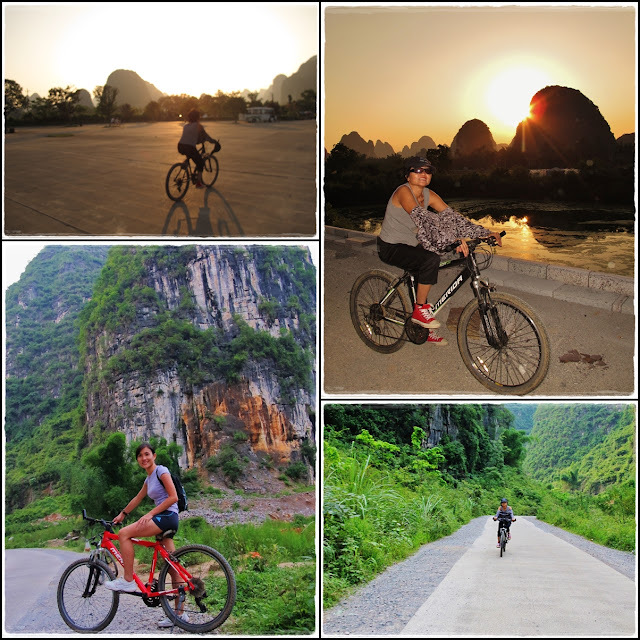 =P I was 'monitoring' the sun as I cycled to find a good spot to watch sunset. 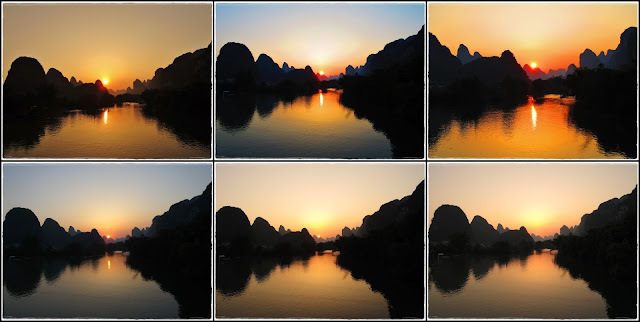 Finally went back to Gongnong Qiao again to watch the sunset. The reflection of the limestones on the still river was so pretty!! So this was the consequence of my brilliant idea to cycle from 12pm to 2pm without putting on any sunblock...lol!! 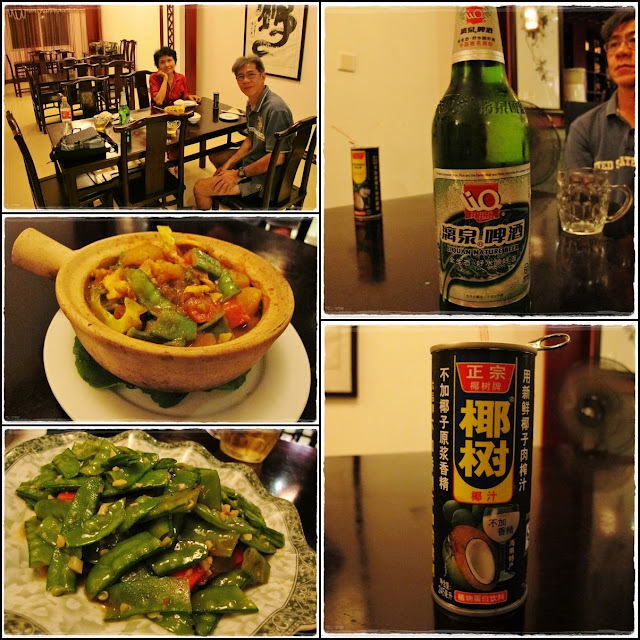 With 2.5 hours to spare before catching the train to Nanning at 4.19pm, we quickly had our lunch and did some last minute shopping. As expected, our train was delayed for an hour again!! 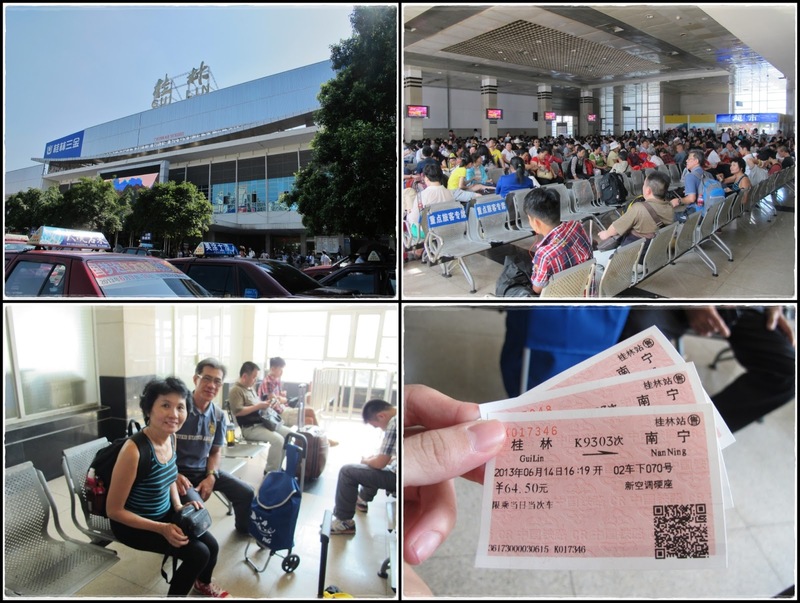 The next time I travel by train in China, I'm gonna give much more time allowance for all these delays. Luckily we're not in a hurry this time so I was fine with the delay. 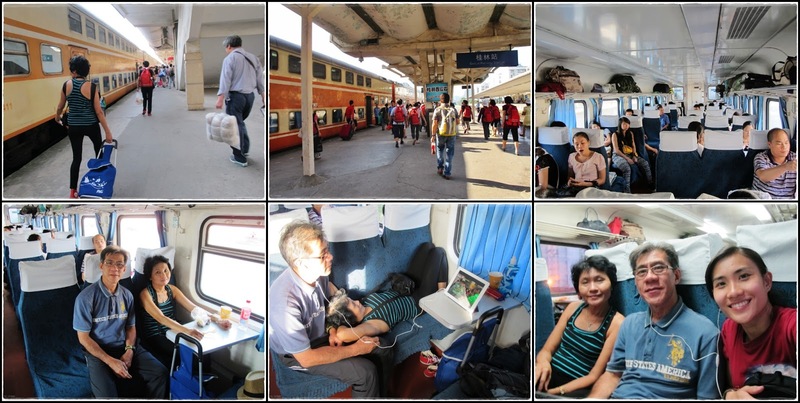 This train was cleaner than the one we took previously and there were quite a lot of empty seats so we could make ourselves comfortable throughout the 6-hours journey. I was watching Running Man with dad and we were both laughing like crazy people during the entire train ride. =P We arrived Nanning at 11pm and took a cab to Nanning Green Forest Hostel to spend the night before catching our flight back to KL the next day. It was quite a challenge fitting everything into our luggage after all the shopping but we managed to go through the airport security without any trouble, thanks to my packing skill...lol!! =P After landing at LCCT at 9.10pm, we took the airport shuttle into the city then bought the midnight bus ticket back to Penang. Pheww....2 days of traveling by bus, train, and plane...so exhausting! !